The name of the folder in Microsoft OneDrive / SharePoint. Opens a dialog where you can search for folders. 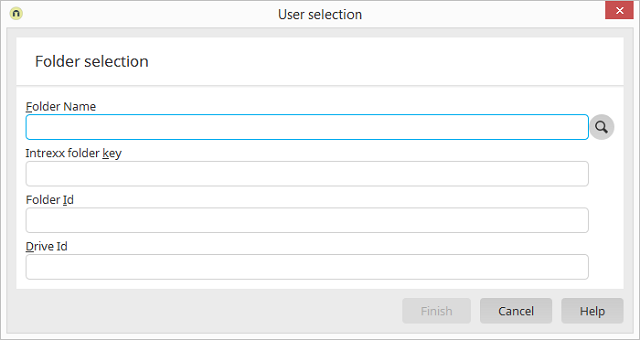 If a folder is selected there, the corresponding data is entered into the fields described below automatically. All 4 fields are required if you are performing a manual configuration. Before the dialog is opened, you will be asked whether you would like to select a Microsoft OneDrive folder or a folder from a Microsoft SharePoint TeamSite. Click on the corresponding button. Enter unique name for identifying a Microsoft OneDrive / SharePoint folder in Intrexx. The folder key may only consist of capital letters, numbers, hyphens and underscores. Folder ID of the folder. Drive ID of the folder.